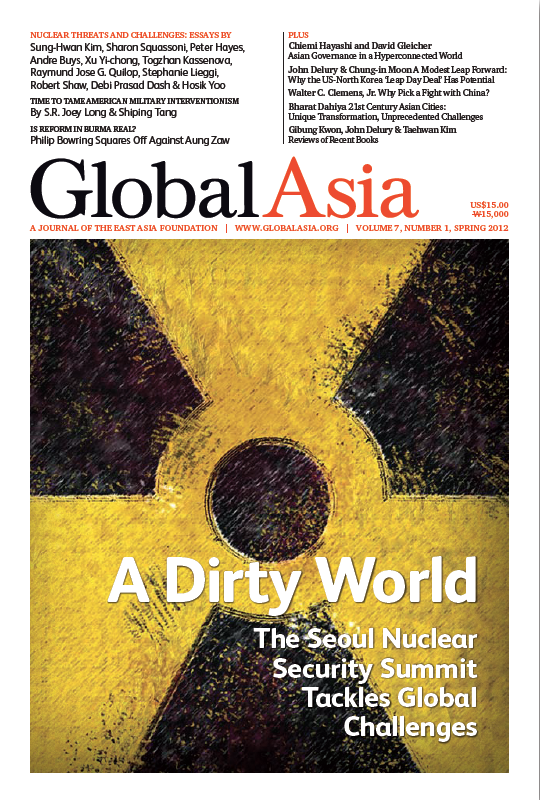 We devote a large proportion of this edition of Global Asia to the complex and wide-ranging security issues that will be front and center at the Seoul Nuclear Security Summit that takes place March 26-27. The hope is, as South Korean Minister of Foreign Affairs and Trade Sung-Hwan Kim writes in our pages, that this summit will build on the achievements of the first Nuclear Security Summit in Washington, DC, in 2010. In a sign of the seriousness with which the international community is taking this endeavor to improve nuclear security and ultimately create “a world free of nuclear weapons,” 58 world leaders will attend the summit in Seoul. The challenges are enormous, and so too are the risks if those challenges are not met. Ensuring nuclear security, which hinges so much on keeping fissile and radiological material out of the hands of the wrong people, is essential if the world is to be protected from nuclear terrorism in the future. But nuclear security also involves revisiting the current technologies and designs that are meant to make nuclear power safe — a need that was tragically underscored by the disaster in March 2011 at the Fukushima nuclear power plant in Japan. This is especially so for Asia, where so many countries are building, or plan to build, nuclear power plants in the years ahead. China alone accounts for 40 percent of the nuclear reactors under construction worldwide. 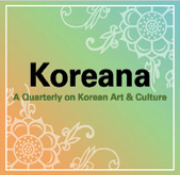 The articles in our cover package provide a comprehensive analysis of why the Seoul Summit is so important to political leaders, policy makers, business people and the public at large, not just in Asia but throughout the world. 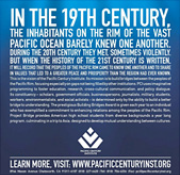 Our articles don’t merely point to problems that need to be solved, but also to possible solutions and policy options. Elsewhere in this edition of Global Asia, we analyze the recent steps toward rapprochement between the US and North Korea in the wake of Kim Jung Un’s assumption of leadership and the surprise Feb. 29 agreement between the two countries to exchange food aid for a halt in nuclear and missile tests and inspections. We also provide an exclusive, insider account of discussions between US and North Korean officials at a recent conference in New York that provides remarkable insight into the opportunities — and obstacles — to achieving peace on the Korean Peninsula. In other articles, we examine the state of Asian cities; the meaning of America’s push for the Trans-Pacific Partnership; the implications of Taiwan’s recent presidential election; how to tame American military interventionism; details of the World Economic Forum’s Global Risks 2012 report, with a focus on Asia; and why it is not wise for the US to try to pick a fight with China. And finally, in our debate section, we pose the question: Is reform in Burma real? We hope that you will find the articles in this issue valuable, and we welcome your thoughts and comments at editoral@globalasia.org. The risks posed by nuclear materials present the world with a unique set of security challenges, whether they involve attempted acts of terrorism or the consequences of natural disasters such as the earthquake and tsunami that damaged the Fukushima nuclear plant. The Seoul Nuclear Security Summit on March 26-27 brings together 58 world leaders to discuss the best ways forward. The Republic of Korea’s Foreign Minister, Sung-Hwan Kim, outlines challenges and opportunities of the Seoul nuclear security summit, to be attended by 58 world leaders in March. Coming in the wake of the Fukushima nuclear accident, which starkly reminded the world of the perils posed by nuclear materials, the Seoul Nuclear Security Summit faces a host of challenges. Peter Hayes notes that the events at the Fukushima nuclear plant exposed a host of design flaws in current nuclear technology whose solutions are linked to dramatically unsettling security issues. Andre Buys argues that there remains the challenge of tracking all of the individuals and organizations that have the nuclear knowledge to pose a continuing threat. Xu Yi-chong argues that the corporate, governmental and regulatory framework in China remains confusing and captive to many entrenched interests that interfere with a clear and safe regulatory environment. 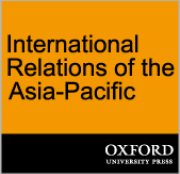 Togzhan Kassenova explores what Taipei itself has done to strengthen domestic nuclear proliferation controls, and what remains to be done. With several Southeast Asian nations poised to build nuclear power plants in the near future, the issue of nuclear security must move up on the region's agenda. As Asian countries face the challenge of strengthening trade controls on nuclear materials, they need to develop human resources and skills to monitor a highly technical field. The volatile South Asian region has long suffered from war and instability. In that context, the tensions between two nuclear-armed states, India and Pakistan, pose a special security challenge. As Hosik Yoo writes, South Korea has stepped forward with an ambitious plan to establish the International Nuclear Security Academy, with construction already getting under way. Is Reform in Burma Real? No one can doubt that Burma has moved forward over the past 18 months, and however skeptical one may reasonably be about the motives and goals of those behind the changes, there is still momentum towards reform. Despite moves toward reform, there are many vested interests in Burma that could derail the process — the army, the government bureaucracy, moneyed cronies, and so on. The one thing that is certain is that things remain uncertain. The Geneva-based World Economic Forum conducts an annual survey of risk perceptions over the coming decade with the aim of stimulating discussion on possible ways of mitigating them. The tangled knot that is the North Korean nuclear issue is closer to some kind of resolution due to the surprise deal announced by Pyongyang and Washington on February 29. Or is it? In the absence of normalized relations between the US and North Korea, so-called “Track Two” dialogue plays a key role in the relationship. The recent push by the US to give greater weight to the Trans-Pacific Partnership could help to reshape the course of trade liberalization and big power politics in Asia. The sustained economic growth of Asian economies in recent decades has brought into focus the important role played by cities. As a result of massive military power and geographical advantages that keep the country isolated from the horrors of war on its soil, American citizens have tended to view foreign military interventions as relatively painless and popular. Walter Clemens suggests that the US and China should restrain their arms buildups and instead accentuate the positive — their shared interests in sustainable development. The fierce presidential election in January was watched closely by much of the world for signs whether Taiwanese voters would endorse the island's policy of closer economic integration with mainland China. As people witness human suffering caused by natural and man-made calamities, how do we reconcile the values of humanity with the fact that the marginal and the poor still suffer from discrimination and oppression?